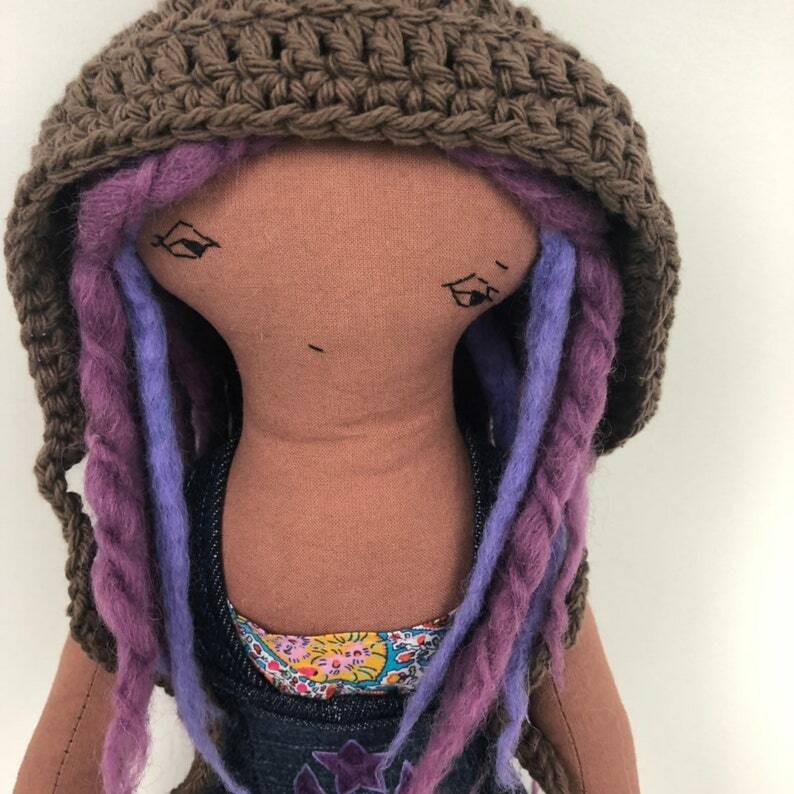 The desire for beautiful purple dreadlocks became overwhelming until one day, just prior to festival season, the transformation was accomplished. And a splendid shade of lavender was achieved. This doll is gender neutral. Made with hand spun woolen locks, reclaimed fabrics, felt ears, button jointed arms and hand embroidered facial features and moon and star pocket on the bibs. Measures 18” tall, not including the hand crocheted cotton hoodie. Love this scrap bag. Very generous quantity and high quality felt. There is so much in the bag that when I opened it to look inside I couldn't get it closed again! lots of variety and colors and the sizes are very usable. I noted on my order I was hoping for more girly colors to use for the project I had in mind. I received a great bad stuffed with tons of felt and some extra pink purple and white! Received package within a week of ordering. All in all I'm very satisfied! Beautiful wool!! We chopped it up and made garland. I'll take a pic when I'm home. OhMa accepts Paypal and Direct Checkout. Thank you for your prompt payment, which signals our shipping department to rush your purchase off to you. OhMa wants you to be satisfied with your purchase. If you are not, please contact us immediately, we will work together to a happy conclusion. Standard ground, USPS. OhMa always tries to ship the next business day after receiving your order. Please contact us if expedited service is needed, we will try to help. We will gladly ship overseas, just convo us with your destination details, we will hold the item in question for you, while we get you a shipping rate quote. Thank you for reading our policies, we hope you have enjoyed your visit with OhMa.